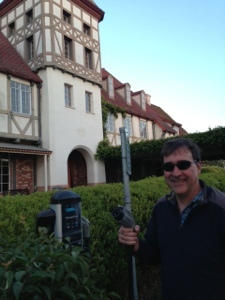 We made it to Solvang Thursday evening before sunset with just four miles of charge to spare. The total number of miles on a single charge from Atascadero to Solvang was the longest of our road trip so far in my husband’s 2012 Nissan Leaf. With a little help from nature and by slowing down, we made it 82.5 miles. We had plenty of downhill sections which gave the 2012 Nissan Leaf a chance to recharge. My husband also tried to go as slow as possible. As one of my blog readers notes, the optimum is to keep at 40 miles per hour, but that is too dangerous on Highway 101. Still, by trying to ” granny drive” as much as possible, my husband conserved energy. We kept the AC and fan off. That was easy because it was chilly out, and we drove in ECO mode. This makes the car much more sluggish, but it is worth it when you can skip stopping for another charge. With 8 miles left in the charge, the car’s low battery warning activates with a spoken warning and it is impossible to ignore the written warning that lights up in the console. As my husband drove, I kept checking the PlugShare App to see how many miles it was to our destination: a charger on Mission Drive in downtown Solvang. At times the destination was four miles more than the juice we had left according to the Leaf. Yes. It was nerve-wracking but we made our decision about 20 miles back, opting out of charging stations in Santa Maria. We had to make it, or risk seeing the dreadedg final turtle warning on what turned out to be International Turtle Day, by the way. As many of my blog readers have noted, you typically have more miles at the low battery warning than the car says. However, we knew we were pushing it. We kept our sense of humor and played some music (the stereo system is solar powered on the Leaf). When we passed the Hitching Post restaurant of “Sideways” fame, we joked that we could just pull in there and drink like the character in the iconic wine film, and then walk (or stagger) to a motel like he did. But in a bit, we entered the Danish village of Solvang. The moon was rising, and the sun was preparing to go down. The charger could not be in a more convenient location. It is in a public parking lot bordering the Petersen Village Inn, where we had reservations. The ChargePoint charger is a double with two hookups and two prime parking spaces. Both were vacant. This is the first one we paid for-45 cents an hour- in the 257.5 miles we have traveled so far from Silicon Valley to Malibu. The hotel clerk was happy to hear we were using it. It is often vacant, she said. At the Solvang Brewing Company across the street from the hotel, my husband ordered a glass of Great Dane Pale Ale and I a glass of Paso Robles Cab. And, we toasted to the Nissan Leaf and our amazing day. Believe me, we slept well, Yesterday we drove 195 miles over 13 hours. Today, we have 110 miles to go until our destination. The number of chargers will increase dramatically as we head south today. I apologize for not including links in these posts. I will do so when we are off the road, and will be posting detailed itineraries and more. Thanks to the many,many readers who are following along and offering encouragement and tips. Keep them coming and let me know what you want to know. Look for more posts later today. Beatifull! I want the review of the hotels you are trying!! 🙂 good luck!! Beautiful! I want the review of the hotels you are trying!! 🙂 good luck! !